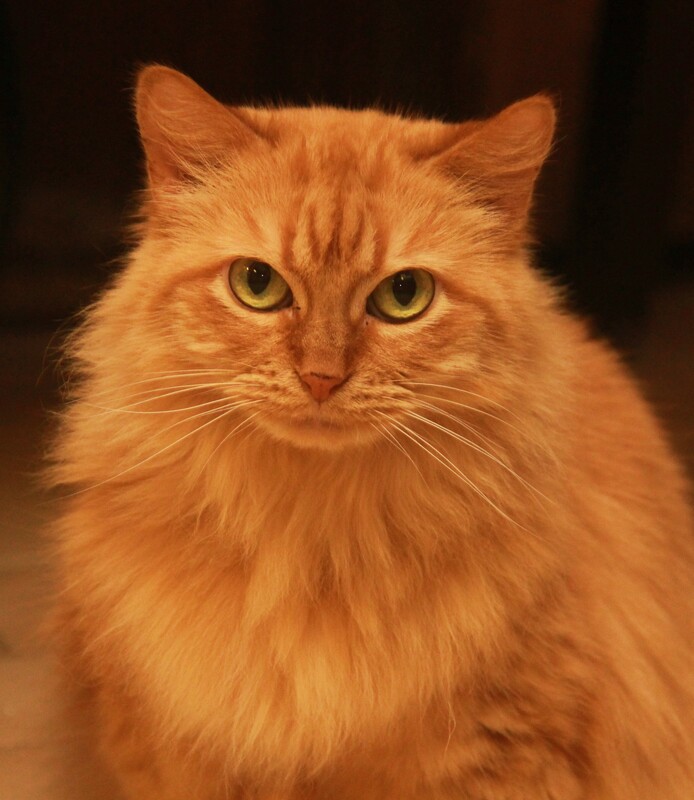 Approximately 75% of solid orange tabbies are male, however, the solid orange gene produces a female now and then. 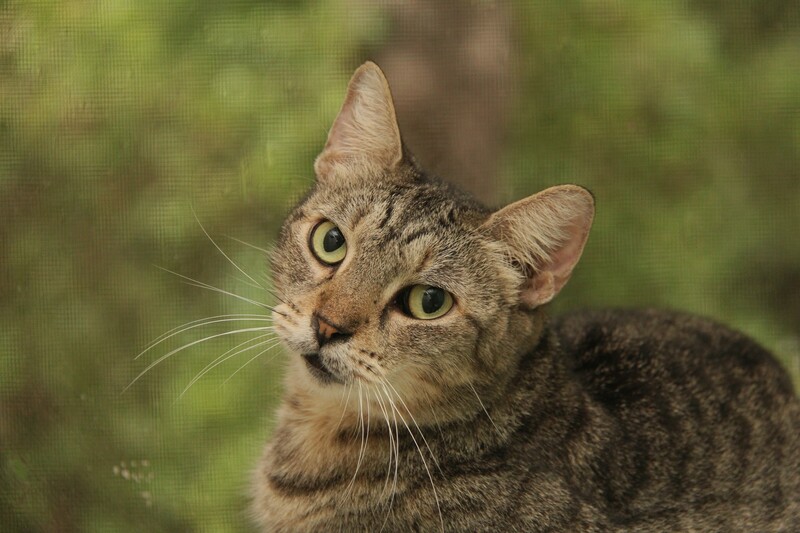 The cat in this photo is named Gweenie who was once feral. She is mostly a loner but she will snuggle next to me if another cat has not claimed the space. Gweenie’s body structure is petite- she weighs about 5 and 1/2 pounds. I think she is among some of my prettiest cats and photogenic as well. Even her meow is petite. I love this little cat. Thank you Rexlin. You are a vey kind young woman and it shows through your posts. Somehow I just knew when I first looked at your blog/s that you are a gentle and kind person. But, you will never believe this. I can hardly believe it myself. The veterinarian that took Addie’s case called me about 7pm last night and told me there was no cancer in the mass nor in the lymph gland. I had prayed really hard for my cat to be cancer free. Of all things the vets concluded that it is swollen lymph tissue from flea allergy. I am so relieved and also mad at myself. I knew she had a flea or two but I was using a fea comb to remove the fleas. I was afraid to give topical med for fleas because it burns her skin. I could have given her capstar but again I was afraid it would lower her immnune system and cause the cancer to reactivate some where in her body. At this point she could have some cancer cells that are else where in her body but they have not reared their ugly head (yet). I just want at least 2 more years or even longer with my little cat. I will post some photos before long of Addie. She is a little calico that (I had raised with her sister). I still have her sister Nellie, and their spit fire mother and grandmother that I had trapped. I had better end this before my note gets any more confusing. Again, thanks for the nice reply. They were beautiful. I love liddy so much. Beautiful quote!!! Thank you Rexlin for the lovely comment. Ghandhi’s quote that refers to animals and people happens to be my very favorite quote without exception. The quote is so insightful and is also quite correct. I like other people’s quotes that refer to cats. dogs, horses, etc, but his is the very best. Liddy was my husband’s favorite cat. She is attached to me now but I don’t give her as much attention as I would like. 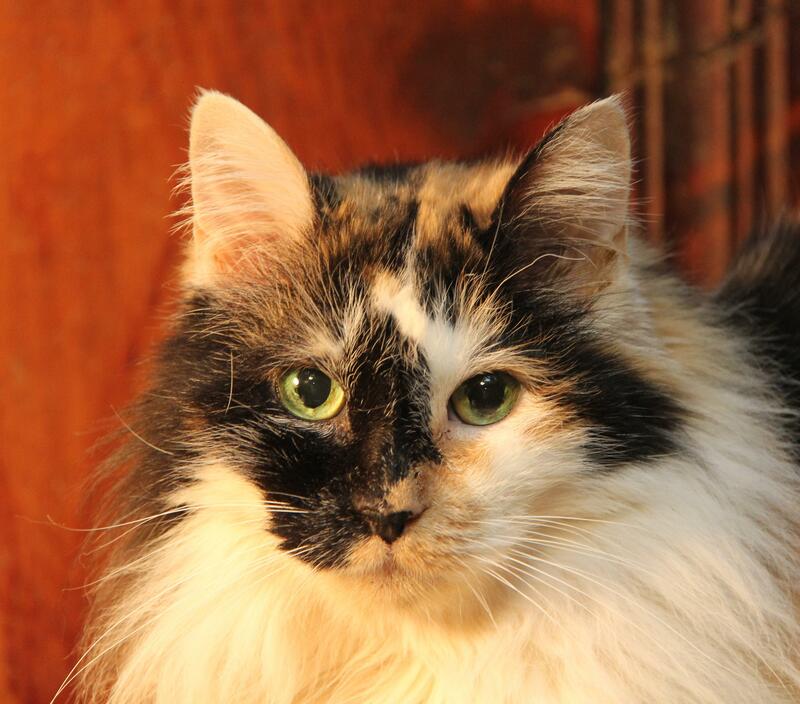 Addie, a little calico is my most favorite cat and is not going to live much longer unless there is some major miracle. I have put off writing about her but there are 2-3 posts about her mammary tumor that were posted on my daughter’s web site and that I moved over to my web site. These posts did not move over as they should have and I have to re-upload the photos that went with those posts. Roght now I am very sad and cried all the home after leaving her at Texas A&M veterinary emergency clinic so that she can get an evaluation to see if another surgery would give her 4-6 months to live. But I amn afraid that the cancer is in the inguinal lymph node and I really don’t know why I think there is a chance for her. I suppose it is becasue she is my favorite cat. She was 13 years old in May, 2012. I only wish that people who owned the cats around my neighborhood take care of them, and not allow them freely roaming the streets.. Thank you for reading the post and commenting. How did you find my web site? I am curious since it has been a slow process to drum up viewers/subscribers. There are too many people that see a cat as a “nothing.” If people don’t care about an animal how can they care about another human being? Thanks again and hope you will return. Thanks for your comment. I’m glad you liked the Ghandhi quote. Of the many quotes re: nations, morality, or about animals, I think his quote sums it all up very well. My opinion about people treating an animal in an inhumane manner, is that “they” are someone that does not care much about another human being. I hope that did not sound too harsh. I am afraid of putting my foot in my mouth for fear that I will offend a reader/ visitor. all are gorgeous. i would love that sweet tiny gweeinie, too! Thank you for commenting. I feel so indebted to you because you have hardly missed a post without commenting. It means a great deal to have this kind of support.